We know many of you have summer plans and we hope you have tons of cool adventures! Since Allegro Pearland Academy of Music is open year-round, it's a good idea to start thinking about summer now! A. The Academy is open year-round, and we do not close in the summer. A. We actually grow in enrollment during the summer months! Some students withdraw, but we get a huge influx of new students for the summer who continue into the fall. A. Many of our teachers are sold out and stay sold out. We maintain a waiting list year-round for prime-time spots! A. Lessons are first come, first serve; so if you withdraw for the summer, we cannot guarantee that we will have a spot for you in the fall, as we will open the spot to new students. Do you want to keep the same time slot in the fall? Do you want to have a spot with the Academy in the fall? If the answers are YES, there are TWO WAYS to keep your spot with the Academy! Please contact the Academy to learn how to save your spot! Tuition is $225 per student for the week and $200 per week for siblings. Register at: allegroacademypearland.com, specify "Summer Strings Camp". 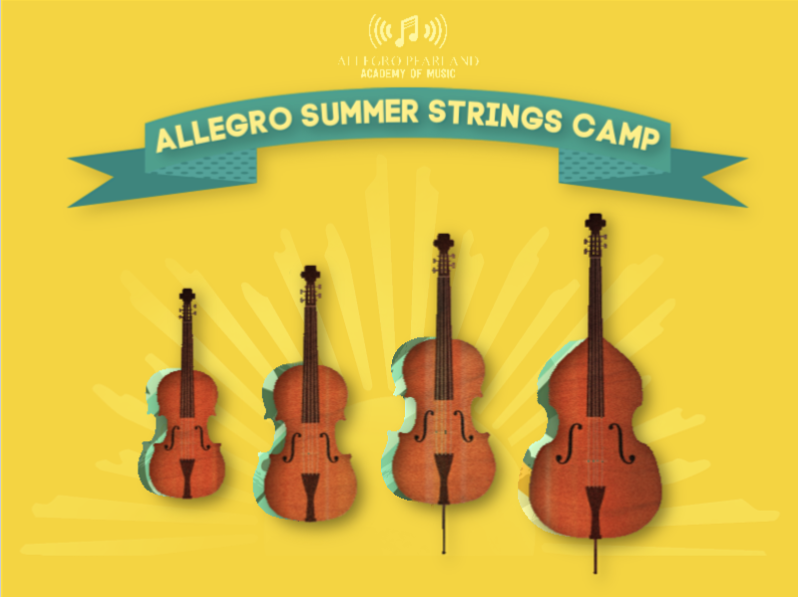 Allegro Summer Strings Camp 2019 will be held July 22-29 from 9:00am-1:00pm with a performance on the last day of camp. This camp is for beg-advanced violin, viola, and cello students interested in playing with an ensemble. Character building activities are included throughout the week. Bring a snack, a lunch, and your instrument! Call 713-452-9402 or register online at allegroacademypearland.com. Allegro Summer Strings Camp will be held at the academy located at 1801 Country Place Parkway #107 Pearland, TX 77584. The Allegro String Ensemble, Pearland's first youth orchestra, is now accepting new members. Please contact the academy for eligibility requirements and registration. The Allegro String Ensemble performs in the Allegro Winter Concerts, Spring Recitals, and various events and festivals. There are many benefits to being in an ensemble. Students learn to work together to accomplish a shared task. They also develop leadership skills, interpersonal skills, and apply what they have learned in lessons. Additionally, students progress at a faster rate than with private lessons alone, much in the same way a baseball player improves by being on a team. Students work together and support each other in a tangible way. Students also make good friends and have a ton of fun along the way! Watch for your invitation for the 2019 Allegro Recitals. The recitals will be held in the Black Box Theater at San Jacinto College South. Space is limited, so watch your email for your SignUpGenius invitation! Should My Child Join the ABRSM Program? Allegro Pearland Academy of Music is proud to partner with the Exam Board of the Royal Schools of Music (ABRSM) to offer an accelerated track for our piano students. Allegro offers performance and theory exams through ABRSM to students participating in the program. ABRSM is the exam board of the Royal Schools of Music, delivering over 650,000 exams and assessments every year in over 90 countries. ABRSM is committed to supporting high-quality music-making, learning and development throughout the world, and to producing the best possible resources for music students. Music making goes beyond playing the right notes on the instruments. Aside from solid and brilliant technique, making music requires a proper musical interpretation. In this set of graded exams, our students will develop their musicianship and musicality while gaining comprehensive music knowledge. This is the perfect class to set a goal, play an instrument, and enjoy the process of learning. ＊Please consult with us for your eligibility for the ABRSM exams. Studio and in-home lessons 7 days a week! We offer private lessons in piano, violin, guitar, voice, viola, cello, ukulele, drums, special needs, brass instruments, youth orchestra, Royal Schools of Music Exam Program and more! We are the home of the Allegro String Ensemble, Pearland's first youth orchestra.